Comes with Original Rolex Box and appraisal cert. 100% Genuine Pre-Owned Rolex Date Just Model 1601 w/Diamond Bezel and diamond dial. This is a 100% Genuine Rolex Stainless Steel Oyster Perpetual Datejust Watch with 6.0 Carats Genuine Diamonds custom added to the Watch. THIS IS THE FULL SIZE DESIRED MODEL FOR MEN WITH QUICK-SET FUNCTION. This watch is in super excellent condition and looks Brand-New on the wrist. An excellent condition datejust model like this is hard to find and if it were brand new it would retail at almost $19,000. The original Stainless steel case is in excellent condition with no Dings, Dents or deep scratches. The Diameter is 36mm not including the diamond bezel. 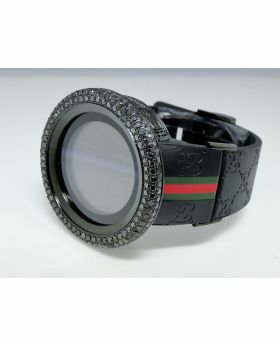 40 mm with the diamond bezel. The crystal has been replaced with a brand new sapphire crystal. A re finished black dial with genuine diamonds set on the numbers. The bezel is solid stainless and consists or beautiful Si1-SI3 clarity diamonds. The bracelet is an aftermarket stainless steel oyster bracelet. Original Rolex case with original Rolex automatic movement with date function. The movement has been recently serviced. Comes with Rolex Box and appraisal certificate.